Advice from experienced cruisers to future cruisers . . . those who are contemplating life aboard as well as those who are already on the five-year plan to leave for an extended period of time. We’re grateful to those who have shared their experiences and excited for those who will follow. There’s a certain gleam in your eye. You’re planning to go cruising . . . indefinitely. You’ll say you’re headed to the Bahamas or to Baja and then you’ll see how it goes from there. But deep down inside you’re hoping to cross an ocean or two, possibly circumnavigate. Why not? Others do it all the time: young couples with kids, middle-agers who plan to break out from the rat race for a while and come back later, and retirees who want to see the world at their own pace. Many of those who have gone before you have offered advice in Good Old Boat. That advice is captured here. What sort of boat you need to go voyaging. What it costs to be out there. What equipment works and what equipment was a waste of the money to purchase and the time to install. What spares you’ll need. Cruising with pets. 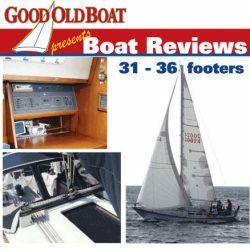 How to equip your boat for cruising. How to make the move to life aboard. Thoughts about overcoming fear, uncertainty, and doubts. How to stay in touch. How to catch rain. How to live without ice. How to do the laundry. Soon you’ll be out there too. When you are, you may write your own articles about your new cruising lifestyle for those who will follow. 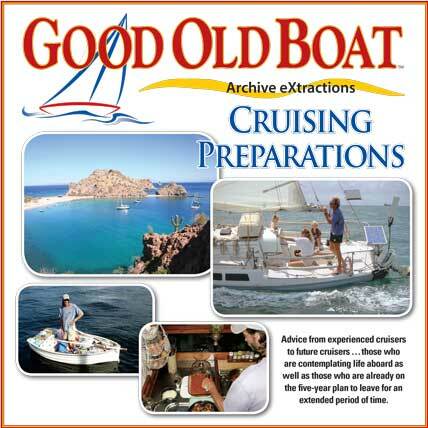 We’ll be happy to add them to our next collection of articles with advice from cruisers to cruisers. Bon voyage! This collection includes 32 articles in 131 pages.